The CRP test measures the high sensitivity C-reactive protein blood level. The CRP test measures the CRP blood level. Why is a CRP test important? The CRP lab test helps screen for cardiovascular risk and inflammation in the body. What type of CRP blood test is this? This CRP test is considered a cardiac, or high-sensitivity, CRP test. This CRP Test is a blood test. The CRP test, sometimes known as a high-sensitivity C-reactive protein test, CRP blood test, or hs-CRP test, is a blood test that measures the CRP level. C-reactive protein is a protein found in the blood that is correlated with the amount of inflammation in the body. For this reason, it is categorized as an acute-phase protein. Produced by the liver, C-reactive protein activates a portion of the immune system known as the complement system when it detects a special molecule on a bacteria or dying cell. In doing so, it tells cells in the immune system to eat and destroy invaders. Ultimately, CRP's purpose is to activate the immune system to clear out foreign invaders. The hs-CRP test has gained importance over the past few decades in traditional medical lab testing for several reasons. The American Heart Association (AHA) stated that CRP blood test levels are helpful in predicting cardiovascular risk. In conjunction with lipid panel test and homocysteine testing, ongoing measurement of CRP blood levels can help guide the aggressiveness with which medical intervention should be pursued. Additionally, the CRP lab test can be monitored and tracked on an ongoing basis to gauge the effectiveness of efforts to reduce inflammation or ongoing therapy. CRP levels tend to be elevated when inflammation is elevated but there is no strong evidence that suggests that CRP itself is the cause of inflammatory states. It is worthwhile to note that CRP levels tend to be higher with the use of oral contraceptives and IUDs and during pregnancy and menstruation. CRP blood levels are also typically lower during ovulation. In the setting of inflammation, CRP blood levels rise quickly. When the inflammation resolves, CRP is also metabolized quickly, leading to lower blood levels. Because C-reactive protein is so sensitive to inflammatory states, it is quite useful as a screening marker for inflammation. To get a high-sensitivity CRP test near you at a Quest Diagnostics lab, just order online and get your blood drawn at the lab. Once your CRP lab results are available, they can be downloaded electronically. 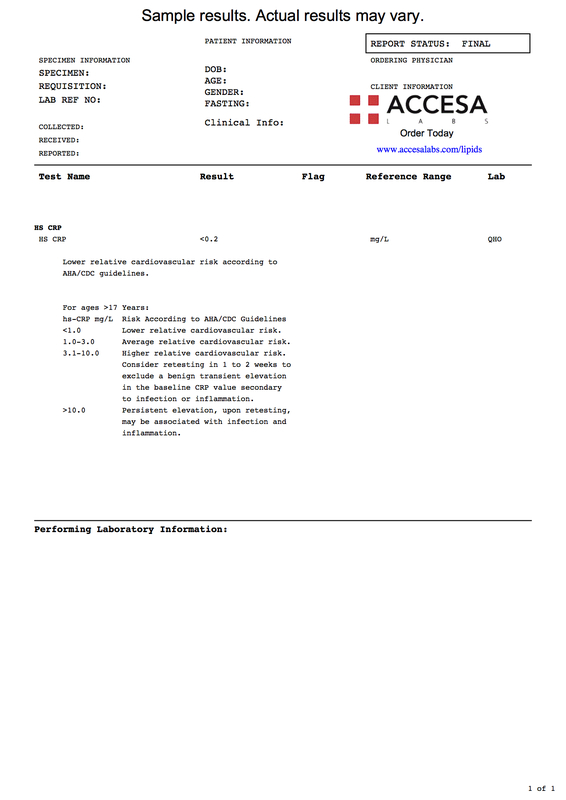 As can be seen on the sample CRP lab report, the CRP blood level is reported as a concentration in mg/L. The CRP level can then be compared against the reference range provided by the lab to help with understanding the relative cardiovascular risk. C-reactive protein was described in 1930. It was originally thought to be a foreign substance because it was elevated during abnormal physiological states but later discovered to be produced by the body. Subsequently, high-sensitivity CRP testing was brought to market and uses a technique called laser nephelometry to detect low levels in the blood. CRP Test at Guaranteed Prices.